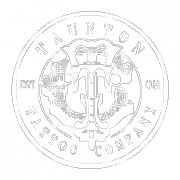 Taunton Tattoo Company is one of Durham Region’s most trusted and reputable tattoo and piercing studios. Health-board inspected and up to date with all health and safety laws, TTC uses high quality, sterile equipment, and jewelry. Our artists are trained professionals capable of designing custom tattoo pieces. Our head piercer, Jessie Darling, is also a toothgem extraordinaire and can bling up your smile with authentic Tooth Fairy™ gems. Come by the shop and check out our lobby, where we have artist portfolios, flash, and lots of merchandise for sale. We stock both plain and fancy body jewelry and if you don’t see something you like, we can order something specially for you! Taunton Tattoo Company is located in North Oshawa at the corner of Simcoe and Taunton. We are within walking distance of Durham College and UOIT. We are open 7 days a week from 11am to 7pm. Every day we offer piercing deals and free consultations, so click on our different pages for more information. We are looking for established new and unique artists to guest spot at our shop! Accommodations can be covered if qualified / Grow with some of the industries finest / weekend or full week spots available. Contact the shop for more info.